Pankaja Munde is allegedly involved in a Rs 206 crore procurement scam. Contracts were awarded without due tender process, and substandard supplies were delivered. Munde is the fourth high-profile Maharashtra BJP leader to be caught in controversy. All four leaders were Fadnavis\'s rivals for the CM\'s chair. BJP has denied infighting, but Fadnavis\'s life has become easier thanks to the lack of a serious challenger. These are certainly not 'Achhe Din' for the embattled BJP. And yet, Maharashtra Chief Minister Devendra Fadnavis may find it difficult to suppress a smile as all his rivals for the CM's chair are now mired in controversy. Nitin Gadkari, Eknath Khadse, Vinod Tawde and now Pankaja Munde - all four leaders who were said to be the top contenders for the CM's chair when Fadnavis got it last year, have suffered setbacks due to controversies, making things easier for the CM. Gadkari has been tainted by the CAG findings, while veteran Khadse, who holds the excise portfolio, is being blamed for the hooch tragedy which claimed nearly 100 lives in Mumbai. Tawde is embroiled in a scandal for possessing an invalid degree. Munde became the latest cause of embarrassment for the BJP on Wednesday when she found herself at the centre of an alleged Rs 206 crore procurement scam. According to a complaint filed by state Congress spokesperson Sachin Sawant with the Anti-Corruption Bureau, Munde's Women and Child Development department awarded contracts worth the aforementioned amount for the purchase of chikki (peanut and jaggery snack), medicines, growth monitoring machines, water filters, carpets and educational material for aanganwadis (child care centres). The alleged catch is that all these contracts were awarded within 24 hours of the proposals being made, in February, without the process of e-tendering that is compulsory for all contracts over Rs 3 lakh. What's more, the eligibility of the firms who bagged the contracts, as well as the quality of products delivered have been called into question. Munde denied any wrongdoing, issuing a statement that said she is being targeted for taking "good decisions in the interest of citizens". And while Fadnavis backed her wholeheartedly, the fact remains that this pushes the BJP further on the defensive, in the light of the recent controversies at the state and national level. Some have alleged that these controversies are a sign of infighting within the BJP. Prakash Bal, senior political analyst in Maharashtra, said: "One cannot exactly say whether this is a product of in-fighting. But controversies allegedly involving these contenders for the chief minister's job, or potential challengers to Fadnavis, will certainly help him consolidate his position as the CM." The BJP categorically refuted the charges of infighting. "All is well in the party and this so-called division among BJP leaders is nothing but media creation," Keshav Upadhyay, party spokesperson, said. Last October, after the state assembly poll results, Munde had created a stir in political circles by stating that she was willing to head the government to fulfill her late father Gopinath Munde's dream. The former deputy CM was the BJP's OBC face, and Pankaja has succeeded him in that regard. Gadkari, Khadse and Tawde, too, had thrown their hats in the ring. Khadse had openly stated that, as the senior-most elected BJP MLA, he's the most suitable candidate for the CM post. Gadkari and Tawde did not make their dream obvious, but supporters of these two leaders openly demanded the appointment of their leaders. Meanwhile, the state Anti-Corruption Bureau (ACB) has asked the Woman and Child Development department to submit the details of the contracts that are at the centre of the controversy. "In the next couple of days the department will furnish the entire details sought by the ACB," a department official said on condition of anonymity. 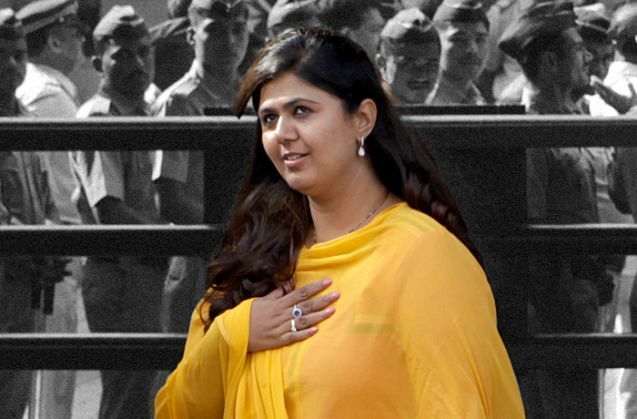 With three other high-profile BJP ministers - Sushma Swaraj, Smriti Irani and Vasundhara Raje - caught in corruption storms, Pankaja Munde has become the fourth thorn in the BJP's side. And everyone is looking to see how Prime Minister Narendra Modi will respond.